The Karim Khan castle (or Arg-e- Karim khan) is a monument located in the center of Shiraz city, dating back to Zand dynasty. This structures consists of several different parts such as rooms, chambers and baths. The walls of this citadel are decorated with beautiful paintings and miniatures all around and the crenellated walls resemble the ancient Persian architecture. 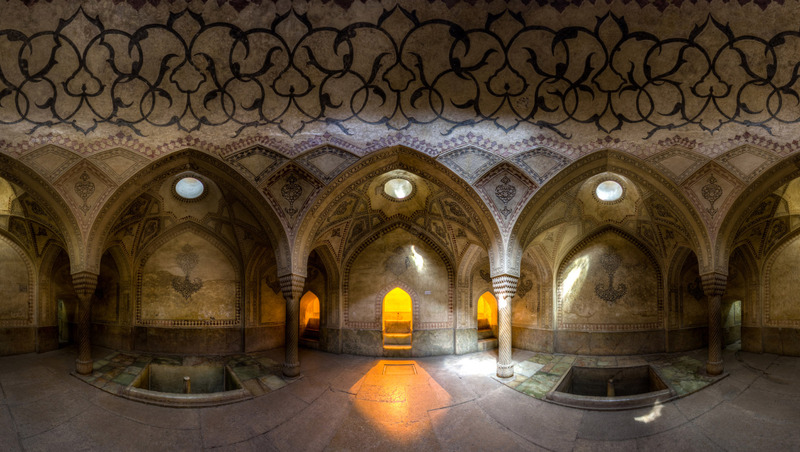 The picture below shows a view of the bath in this complex. The unique architecture, lighting and patterns presented in the Iranian baths catch any visitors eyes from the first glance. Seeing this place gave me a historic mood,since the moment we are looking at the walls and sentry tower from outside,till we come inside and to the yard,this mood is feeled more and more,and when you arrive to the bath it reaches it’s maximum.and the play of light in that dark place and coolness of the space,adds to this mood.